Yes, the text on the card is not even on purpose. This card was made especially for a nature-loving friend of mine. I was a little sad the blueprints didn't show up very well, but if anyone can tell what the leaves are without needing to look them up, it's her. I am very thankful and grateful to have her in my life as a friend. 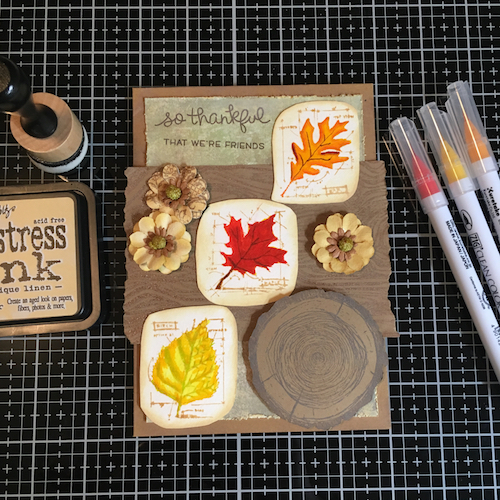 Simon Says Stamp Work It Wednesday Challenge October 2018: Give Thanks! and Frilly and Funky Challenge: A Harvest of Gratitude. *I would advise against trying to use this particular stamp. It has never produced a good impression when used with any type of stamping tool or stamp block, despite multiple attempts and much finagling. The only way I got this stamped was to take it off the stamping tool and mash down the center by hand. Starting with your kraft card, ink the edges with Gathered Twigs, lightening as you move inwards. Take a sheet of green-ish paper from The Old World Mat Stack and use the paper distresser on all four edges. Because of the way this paper tears, you may need to use it on both sides of the edge to get the desired effect. Go over the distressed edges with a blending tool and the Distress Oxide in Antique Linen. On the watercolor paper, use the Distress Ink in Antique Linen to stamp out the three leaves. Listed above are the colors for each leaf, in the approximate order that I used them. When the leaves are colored to your satisfaction, cut out each leaf blueprint and ink the edges with Distress Oxide Antique Linen. Using either the ATG or glue, affix the green paper to the front of your card in the center, followed by the brown wood grain. Before adding other dimensional elements, figure the position your sentiment needs to be stamped in and use Distress Oxide Walnut Stain to do so. Inside the card stamp your preferred greeting also in Walnut Stain; I chose a stamp from the "Hello Friends" Lawn Fawn set (note that it is a retired stamp set). 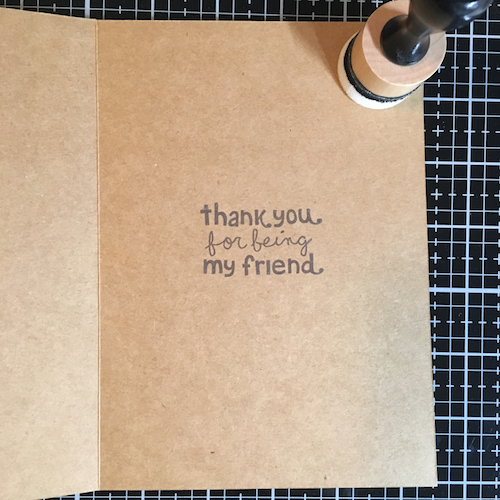 I was glad I used my stamping tool for that because it did take two tries to get the saturation I was looking for in the ink. Use pop dots to affix the tree cross-section to the bottom right front of the card. Glue the leaves onto it next, and finish with gluing on the paper flowers. Give to someone who means a lot to you. I kept the inside of the card simple. Christina, you've made a perfectly heartfelt card for your friend. the leaves are so realistic! She is going to treasure this! Thank you so much for sharing your card with us at Frilly and Funkie for our Harvest of Gratitude challenge! Hugs! Your friend should be thrilled with your lovely card and the leaves are coloured so nicely for fall. Thanks for joining us at Frilly and Funkie. I've been papercrafting for some years now. I have my Bachelor's degree in graphic design and used to work part-time at an arts and crafts store. My new job is full-time and I'm still in the training portion of it. I miss having so much more free time for crafting! I'm also a member of the Oak Park Women's Exchange, a crafting co-op. My menagerie includes one dog and three guinea pigs. Why "Lix"? It's a nickname I acquired online through an abbreviation of a character named Felixia. I've used it for so long now it's carried over into other parts of my life. Most people though know me as simply Christina. Why use "Lix" as my logo? My name is 19 letters long, not readily lending itself to a logo. And there are famous C.K.s out there I want to stand out from. Christina Kowalewski © 2017-2018. Awesome Inc. theme. Powered by Blogger.